Lake Arrowhead is located in the mountains of Southern California. Lake Arrowhead, part of the San Bernardino National Forest, is just 90 miles east from Los Angeles, and a paradise of outdoor recreation and year-round beauty. The San Bernardino Mountains present a spectacular showcase of life by offering visitors over 2,000 species of flora and nearly 400 species of fauna. Many, many movies have been filmed in lake Arrowhead, including "Heidi", "Magnificent Obsession", "The American President," "Space Jam," and "The Parent Trap." Water Level: Average water level variance? 5-20 ft. Registration: All boats 12 feet to 26 feet in length must be registered and display current state sticker & number (CF, AZ, etc.) on both sides of bow and ALA sicker on starboard (right) windshield or bow or on sailboats on the starboard side or mast. The boat owner is personally responsible for the safe operation of their boat at all times, including requiring ALA licensing of the operator. No owner of a vessel may rent or lease their vessel to another. No boat shall remain overnight on the lake without being in the boat owner's slip or having a slip rental agreement on file with ALA. Note: Non-powered flotation devices and swimming aids may be used only within 100 feet of the shoreline. Green Valley: 37 campsites, 22 suitable for tents or campers, 13 for trailers or RVs. The maximum length of spurs is 22 feet. A lush meadow surrounds this campground, which is located among tall pines. Nearby Green Valley Lake offers swimming, fishing and boating. Forest roads in the area are great for mountain biking and scenic driving. Located one mile east of Green Valley Lake, at the end of Green Valley Lake Road. 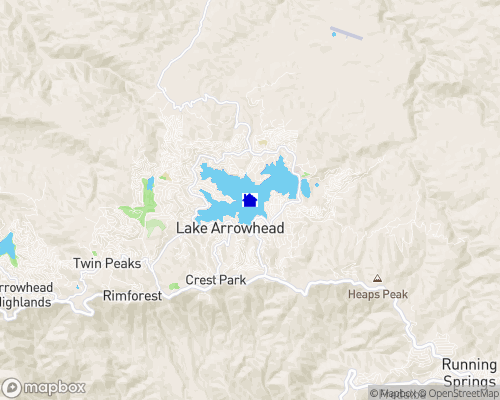 Lake Arrowhead CA is nestled in a magnificent forest of pine, cedar, and dogwood at an altitude of 5100'. In an area described as the "Alps of Southern California", the Lake Arrowhead communities are totally surrounded by the San Bernardino National Forest. Visitors are attracted to this beautiful mountain resort located in the San Bernardino Mountains, by many recreational activities including hiking, camping, lake tours, snow skiing and ice skating. Shopping for Real Estate? Look for your Dream Home while staying at one of our many charming lodging facilities. Lake Arrowhead is the home of the most beautiful Bed and Breakfast Inns and Vacation Cabins. Lake Arrowhead is also home to the famous Saddleback Inn, a charming historic Inn at the entrance to the lake and village.